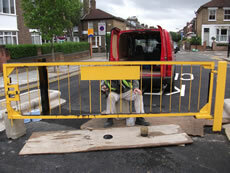 The gate between the two width-restricted lanes leading at the junction of Goldsmith Road and Goldsmith Avenue has been getting plenty of attention from Ealing Council contractors. Much to the surprise of residents, the width restriction has been smartened up and given new, apparentlly indestructible fluorescent signs and should be easier to negotiate, meaning fewer destroyed wing mirrors and scraped vehicles. The gate, providing a barrier across the middle of the road, was painted yellow yesterday, but today the painter was back at work again as it has been decided that it should be painted black. 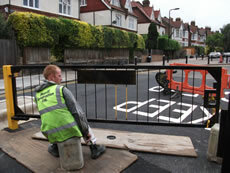 Residents agree the black certainly looks smarter, but one remarked: "I'm not sure who decides about paint colours in the Highways Department, but perhaps it would be a good idea to make the right decision first time round so that the job is done as quickly and cheaply as possible in these times of squeezed budgets and cuts."